As the white-throated sparrows move through in the spring keep your eyes open. All may not be as it seems. Here in the Twin Cities and in countless other areas, we get thousands upon thousands of white-throated sparrows migrating through in the spring as they head north. They don't stick around long but their distinctive white throat and "Oh Sweet Canada, Canada, Canada" call are a much welcome sign of spring. Seeing the first one each year is a treat but keep looking, you might be missing out if you start to ignore them. 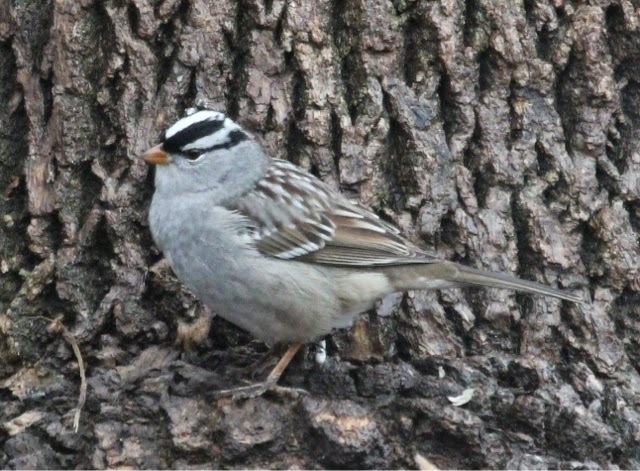 Mixed into flocks of white-throated sparrows will often be a white-crowned sparrow. White-crowned sparrows belong to the genus Zonotrichia along with the White-throated, Golden-crowned, Fox and Harris's sparrows. At a quick glance it is easy to dismiss these beautiful birds for yet another white-throated sparrow so keep your eyes open. They often hang out in flocks with white-throats sparrows so you need to look carefully. White-crowned sparrows are found in the from mid-Iowa south in the winter and in some places out west year-round but are only in Minnesota during migration. They will soon leave for the very northernmost parts of Canada to breed. Get out there and enjoy them while you can.